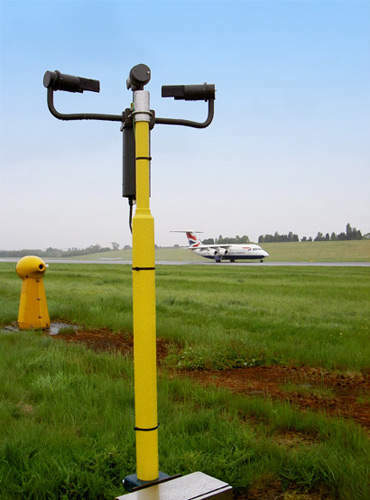 Aeronautical & General Instruments (AGI), an established UK company, manufactures instruments and systems for busy airport runways, including portable / emergency airfield lighting systems, runway visual range systems, airport surface wind measurement systems and AWOS (Automatic Weather Observing Systems). In 2007 AGI acquired Metalline International and consequently its division Metalite Aviation Lighting. Metalite Aviation Lighting is able to offer a full-range of portable emergency airfield lighting systems, covering runway and taxiway-edge lights, approach lights, PAPIs and obstruction lights. Products are battery and generator-powered and can provide visual and NVG-compatible light outputs, making them suitable for use by civilian and military users. Lighting can be supplied as individual units supported by freestanding battery chargers or in road going trailers with integral charging facility. The Metalite COREL LED is an energy-efficient battery powered portable runway light, which meets FAA, ICAO and CAA specifications in the full range of aviation lighting colours / applications. These super-efficient portable aviation lights offer unparalleled run times, meaning reduced maintenance and fewer charge cycles, resulting in a greater return on investment. Simple drop in charging keeps recharging cycles down to a minimum amount of effort for ground staff. Built to last and to withstand the harshest environments, Metalite products are renowned for their high build quality and use in extremes, such as deserts, tropical conditions and sub zero locations, including the Antarctic. The full range of LED products is available with MESH network technology, allowing the runway lights to be operated from the air traffic control tower, up to a range of 4km, each light then re-transmits the signal to the next light, ensuring the signal is not lost by obstructions and allowing an infinite length of runway. A battery-powered portable visual-spectrum precision approach-path indicator, the VIS PAPI, uses an incandescent light source and is suitable for night-time use in compliance with CAA document CAP 168. Recently launched by Metalite is the world’s most power-efficient PAPI LED, meeting FAA and ICAO specifications for both night and daytime operation, with runtimes in excess of 1,100 hours on a single battery charge. 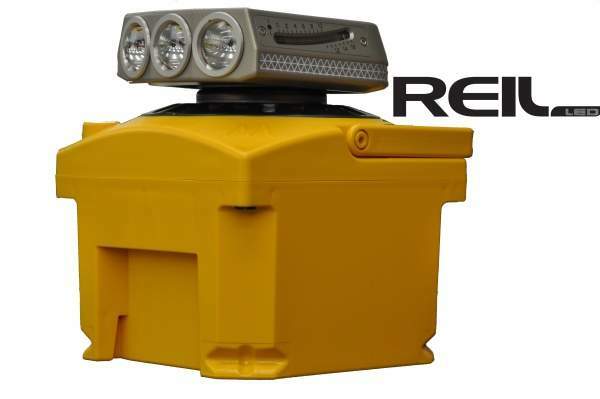 A pair of battery-powered portable approach lights suitable for night-time or daytime use, the REIL LED’s provides a synchronised strobe light up to 15,000 candela to identify the runway end or threshold of a visual or instrument non-precision runway. Highly efficient, the REIL LED can operate up to 1,100 hours on a single 8 hour battery charge, meaning that they can remain in place for long periods of time before recharging is required. A battery-powered portable approach light suitable for night-time use, the UAL enables pilots to identify the runway centreline during approach. Our freestanding, portable drop-in charger for the range of halogen or LED runway lights is capable of charging up to 16 halogen or LED CORELs, REIL LED’s and UALs simultaneously in approximately eight hours. Highly portable and protected within a durable PELICASE design, this is an ideal solution for helipads, obstruction areas and smaller lighting requirements. 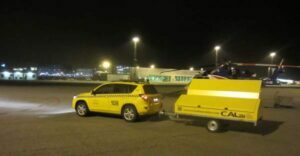 A versatile trailer-mounted, battery-powered portable runway lighting system that complies with international civil aviation standards, the Civil Airfield Lighting KIT (CALKIT LED) can be used as a stand-alone, temporary system on remote airstrips or as emergency, supplementary or obstruction lighting at international and domestic airports. 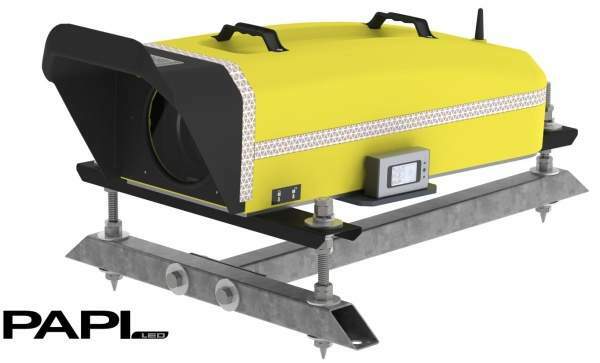 Holding up to 66 light units, the CALKIT LED can deliver lighting for runways of up to 2,800 meters in length, with runway edge lights spaced at 100m. 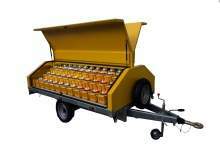 It can be easily deployed within 20 minutes with two operators. CALKIT has been deployed in every Continent throughout the world since the since 1992 and continues to be the market leader in this sector. 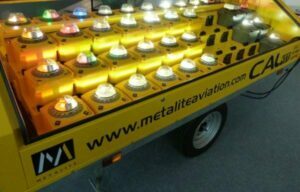 Aeronautical & General Instruments Ltd business unit Metalite Aviation Lighting is launching a brand new static version of the world renowned CALKIT LED, the CALKIT LED Quadcon. The system addresses the need for customers that require portable airfield lighting, but do not need a dedicated trailer to mobilise the lights around the airfield or via road. Portable aviation lighting is nothing new and has been around for decades, with arguably its earliest form being the goose neck flares used from the early 1940's during wartime. CALKIT LED is a versatile, battery-powered runway lighting system specifically designed for airport or airfield use. British Antarctic Survey operates in some of the harshest environmental conditions on the planet. The airstrip at Rothera Research Station is a lifeline to the team onsite, for flying science teams to deep-field study sites and for delivering essential supplies and equipment. Safety is a paramount concern and runway visibility for pilots can be difficult at times to say the least. The aviation industry has had to cope with some serious financial difficulties in recent years, not just the worldwide economic depression, but volcanic ash clouds, industrial action and fuel prices have all had a significant impact to the sector's bottom line. 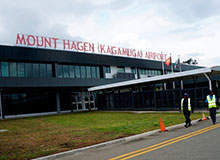 Mount Hagen International Airport, also known as Kagamuga Airport, is the second biggest airport in Papua New Guinea (PNG). Metalite Aviation will once more be in attendance at the popular ATM event from 4 to 6 March. This year at the world's largest defence and security exhibition held at the ExCeL, London, Metalite received a number of strong enquiries for both our military and civilian portable airfield lighting solutions. Our market-leading LED products stirred much interest, especially when visitors were informed about the astoundingly efficient run times of our runway edge, taxiway and obstruction lights from a single eight hour charge. Metalite Aviation, a trading division of Aeronautical & General Instruments Limited, is delighted to announce the award of Patent 2488598 for its Portable and fixed PAPI LED Aviation Approach light system. Launched in 2011, the system features super-efficient light engine technologies, which help provide extraordinary run times compared to competitive battery-powered PAPI systems. Aeronautical and General Instruments Ltd. and Metalite Aviation Lighting are delighted to be exhibiting again this year at DSEI, the world's largest fully integrated defence and security exhibition. Having finalised the development of Metalite's exciting new range of LED Portable Airfield Lighting solutions for applications in both the civilian and military markets, Metalite have now updated its website with new images, data sheets and video of its latest suite of products. Metalite, a UK company that manufactures instruments and systems for busy airport runway, has released a new free white paper titled The True Cost of Not Having Portable Emergency Lighting at Your Airport. AGI has released a new white paper on the benefits of portable battery powered LED runway lighting.